Barcelona ensure their qualification to the knockout stages with superb 5-0 win over AS Roma on tuesday night in the champions league group stages. Lionel Messi started his first game in 2 months and he was at the heart of the action scoring twice and creating a couple. Suarez also scored 2 goals while Pique was on scoresheet as well in what another emphatic win for FC Barcelona. Lionel Messi has not lost his magic after being out for 2 months, he started against Roma and creat havoc whenever had the ball. Suarez and Messi scored brace while Adriano and Pique were also on target in what was a superb show at Camp Nou with 6-1 thrashing for AS Roma. Watch Match Highlights here. Barcelona are coming into this game on the back of a massive 4-0 win over bitter rivals Real Madrid. Neymar and Suarez kept their superb run of form with both hitting back of the net while Messi made first appearence as a sub against Real Madrid in over 2 months. Jose Enrique might not start Messi for Roma clash becase all Barcelona need is a point to not only qualify but finish as group winners as well. We will have the match highlights of tuesday, 24th november 2015 clash right here on this page after the game. Until than check out highlights from the champions league matchday 1 when Alessandro Florenzi wonder goal canceled out Luis Suarez first half strike. Roma 1-1 Barcelona (Matchday 1 Review): Barcelona AS Roma in their first champions league game this season and it was always going to be a touch match but Barcelona took the lead in 21st minute through Suarez. 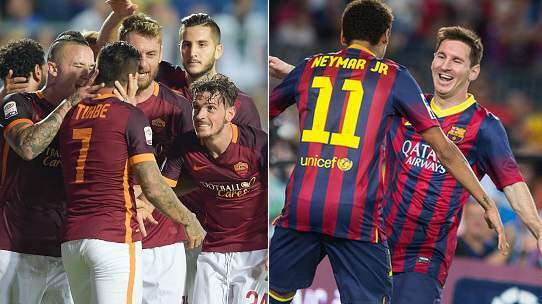 Barcelona overall shadded the early exchanges but a wondergoal from Florenzi brought Roma back into the game. Afterwards Roma played on the counter throughout the game while Barcelona had much more of the ball. Game finished 1-1 as neither side could get the winning goal, watch match highlights here. AS Roma vs Barcelona Preview & Team News: Roma suffered a humiliating 7-1 aggregate defeat in the hands of Bayern Munich last season and they will be eager to get things right this time around in Europe’s premier competition. Roma need to get somthing out of home match against Barcelona because Bayer Leverkusen are a decent side who can cause problems for Roma for second place plus BATE Borisov are no pushovers. Barcelona have won 5 Champions League titles in modern era of the competition (from 1992-2015) making them the most successful team in last two decades. They will be looking to become the first team to win back to back Champions League titles this season. Barcelona usually tend to struggle against Italian side and they will be eager to better their record of only 1 win in last 6 outings. Team News & Possible Lineups: Miralem Pjanic is likely to miss the game against Barcelona joining Kevin Strootman on the sidelines. Radja Nainggolan and Totti should start for Roma where Edin Dzeko set to play upfront while Gervinho, Iago Falque and Salah to play in attacking midfield roles. Barcelona will have Pique back in the starting lineup alongside Mascherano, Sergio Roberto might start ahead of Dani Alvez at right while Messi, Neymar and Suarez to continue as front three. Here is how I expect both teams to lineup. Match Highlights: The match will start at around 19:45 uk time and we will have the goals video and match highlights right here after the match in both english and spanish commentaries. So join us here after the final whistle to see extended match footage.